Lock: [singing] I say that we take a cannon, aim it at his door, and then, knock three times, and when he answers, Sandy Claws will be no more! Shock: [singing] You're so stupid! Think now! If we blow him up to smithereens, we may lose some pieces! Jack Skellington: [unwrapping Oogie Boogie] How dare you treat my friend so shamefully! 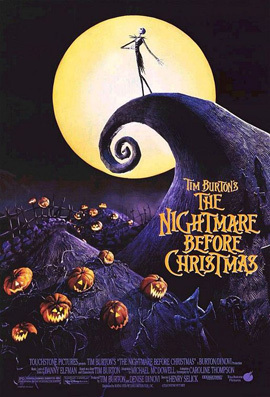 Jack Skellington: [singing] You know, I think this Christmas thing is not as tricky as it seems! But why should they have all the fun? It should belong to anyone! Not anyone, in fact, but me! Why, I could make a Christmas tree! And there's not a reason I can find, I couldn't have a Christmastime! I bet I could improve it, too! And that's exactly what I'll do! Lock: [of Jack] There he is! Shock: Just like we said! Mayor: [throws Jack a ladder] Grab ahold, my boy! Man Under the Stairs: [singing] Will it bend? Clown: [singing] It's a rat! Man Under the Stairs: [singing] Will it break? Undersea Gal: [singing] Perhaps it's the head that I've found in the lake. Big Witch, W.W.D., Small Witch: Say it once, say it twice, take a chance and roll the dice. Ride with the moon in the dead of night. Jack Skellington: [singing] My dearest friend, if you don't mind... I'd like to join you by your side. Where we can gaze into the stars...For it is plain, as anyone can see. We're simply meant to be. Jack Skellington: Merry Christmas! And what is your name? Jack Skellington: That's all right. I have a present for you anyway. There ya go, sonny! Ho ho ho! HEEHEEHEE! Jack Skellington: [flying away] Merry Christmas! Jack Skellington: [singing] What's this? What's this? There's color everywhere! What's this? There's white things in the air! What's this? I can't believe my eyes, I must be dreaming; wake up, Jack, this isn't fair! What's this? Barrel: I'm not the dumb one. Santa: Bumpy sleigh-ride... Jack. Next time you get the urge to take over someone else's holiday, I'd listen to her. [points to Sally] Santa: She's the only one who makes any sense around this insane asylum! Santa: To fix Christmas? Of course there is! I'm Santa Claus! Harlequin Demon: [singing] Won't they be impressed, I am a ge-ni-us! See how I transform this old rat inTO a most deLIGHTful hat! Jack Skellington: [singing with false pomp] And I, Jack, the Pumpkin King, grow tired of the same old thing. Oogie Boogie Man: Well well well. What have we here? Sandy Claws, huh? Ooo I'm really scared! So you're the one everybody's talking about? Oogie Boogie Man: [singing] You're joking, you're joking/I can't believe my eyes/You're joking me, you've gotta be/ This can't be the right guy! He's ancient, he's ugly/ I don't know which is worse! I might just spit a seam now if I don't die laughing first! Vampire: [about Jack, who is missing] I peeked behind the Cyclops' eye - I did! - But he wasn't there. Mayor: Terrible news, folks! The worst tragedy of our time! Jack has been blown to smithereens! Sally: [sings] I sense there's something in the wind / That feels like tragedy's at hand. / And though I'd like to stand by him, / Can't shake this feeling that we have. / The worst is just around the bend. / And does he notice / My feelings for him? / And will he see / How much he means to me? / I think it's not to be. Jack Skellington: [spoken] That's right. I AM THE PUMPKIN KING! Sally: You certainly do, Jack. I've had the most horrible vision! Lock, Barrel, Shock: Jack! Jack! We caught him. Lock, Barrel, Shock: We got him. Jack Skellington: Perfect! Open it up. Quickly! Jack Skellington: That's not Sandy Claws! Behemoth: [the Easter bunny hops up a set of steps and up to the Behemouth, sniffing him - he points at it] BUNNY! Jack Skellington: Not Sandy Claws... Take him back! Jack Skellington: Which door? There's more than one! Sandy Claws is behind the door shaped like this. Jack Skellington: [Lock and Shock fight, Jack buries his face in his hand and after a moment stretches out his jaw and screams] AURR! Jack Skellington: [to the Easter bunny] I'm very sorry for the inconvenience, sir. Jack Skellington: Take him home first. And apologize again. Be careful with Sandy Claws when you fetch him. Treat him nicely. Lock, Barrel, Shock: Next time. Clown: [singing] I am the Clown with the tear-away face! Clown: [Demonic voice] Here in a flash and gone without a trace! Clown: [of Jack's disappearance] This has never happened before! Big Witch, W.W.D. : It's suspicious. Sally: [examining Jack in his newly-finished Santa suit] You don't look like yourself, Jack. Not at all. Jack Skellington: Isn't that wonderful? It couldn't be more wonderful! Sally: [holds up the clipboard sketch of him] But you're the Pumpkin King! Jack Skellington: I feel SO much better now! Jack Skellington, Lock, Barrel: [come in] Jack! Jack! This time we found him! Jack Skellington: This time we really did. Lock: He sure is big, Jack! [the Halloween citizens gasp in awe] What a pleasure to meet you. Jack Skellington: Wh - ! Why, you have hands! You don't have claws at all! Jack Skellington: [dazed] Where am I? Jack Skellington: Consider this a vacation, Santy. A reward. It's your turn to take it easy. Santa: B-But there must be some mistake! Jack Skellington: See that he's comfortable... Just a second, fellas! Of course! That's what I'm missing! Santa: Hold on! Where are we going now? Sally: This is worse than I thought. Much worse. I know! Oogie Boogie Man: [after having his sack body ripped open] Now look what you've done! My bugs! My bugs! My bugs! Jack Skellington: Mmmmm... an interesting reaction! But what does it mean? Jack Skellington: That's not my Christmas! My Christmas is filled with laughter, and joy... and this: my Sandy Claws outfit. I want you to make it. Jack Skellington: I have every confidence in you. Sally: But it seems wrong to me. Very wrong. Mayor: The King of Halloween has been blown to smithereens! Skeleton Jack is now a pile of dust! Lock, Shock, Barrel: Pile of dust! Pile of dust! Skeleton Jack is a pile of dust! Sally: [singing] What will become of my dear friend? / Where will his actions lead us then? / Oh, how I'd like to join the crowd / In their enthusiastic cloud. / Try as I may, it doesn't last. / And will we ever / End up together? / No, I think not. / It's never to become, / For I am not the one. Lock, Shock, Barrel: Kidnap Mr. Sandy Claws? Lock: I wanna do it. Shock: Jack said we should work together. Barrel: Three of a kind. Lock: Birds of a feather. Lock, Shock, Barrel: Now and forever! Mayor: Oh. How jolly our Christmas will be. Shock: And we thought you didn't like us, Jack. Jack Skellington: leave that no-account Oogie-Boogie out of this! Dr. Finkelstein: Sally! You came back. Dr. Finkelstein: Shall we, then? Dr. Finkelstein: What a joy to think of all we'll have in common. We'll have conversations worth having. Santa: [from in the bag] Me on vacation? On Christmas Eve? Barrel: Where are we taking him? Lock: To Oogie Boogie, of course. There's no where in the whole world more comfortable than that. And Jack said to make him comfortable, didn't he? Barrel, Shock: Yes, he did. Oogie Boogie Man: Are you a gambling man, Santa? Jack Skellington: [singing] Of course, I've been too close to see! The answer's right in front of me! Dr. Finkelstein: Mm, what's this? Sally: Oh, don't be silly! Lock, Shock, Barrel: [singing] Kidnap the Sandy Claws, / beat him with a stick, / lock him up for ninety years, / see what makes him tick. Smaller Mr. Hyde: Let me see, let me look. Smallest Mr. Hyde: Is it rotted and covered with gook? Oogie Boogie Man: J-J-J-Jack! But they said you were dead. You must be - double dead! Mayor: let's try it at once! Jack Skellington: Can SCREAM like I can / With the fury of my recitations. Dr. Finkelstein: You've poisoned me for the last time, you wretched girl! Mr. Hyde: [approaching with his foot stuck in a pumpkin] I tromped through the pumpkin patch. Santa: [singing] Release me now or you'll have to face the dire consequences. / The children are expecting me, so please come to your senses. Oogie Boogie Man: [singing] You're jokin', you're jokin'! / I can't believe my ears! / Would someone shut this fella up? / I'm drownin' in my tears! / It's funny, I'm laughing! / You really are too much. / And now, with your permission, / I'm going to do my stuff. Oogie Boogie Man: I'm gonna do the best I can! Santa: Release me fast or you will have to answer for this heinous act. Jack Skellington: [singing] And on a dark cold night, under full moonlight, he flies into the fog like a vulture in the sky! Jack Skellington: And they call him, Sandy... Clawssss...!